In the dying days of an Australian logging town, Christian (Paul Schneider) returns home for his father Henry’s (Geoffrey Rush) wedding to Anna (Anna Torv), a much younger woman. While home, Christian reconnects with his childhood friend, Oliver (Ewen Leslie), who has just lost his job at Henry’s timber mill. As Christian gets to know Oliver’s wife Charlotte (Miranda Otto), daughter Hedvig (Odessa Young) and father Walter (Sam Neill), he discovers a secret that could tear the family apart. 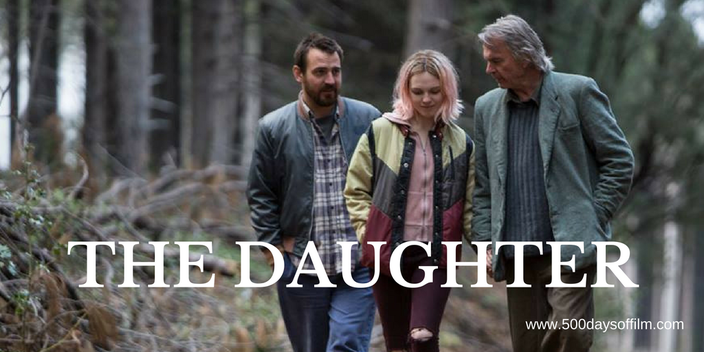 Director Simon Stone’s debut film, The Daughter, is a tense and moving drama about the struggles, secrets and lies of ordinary life. The film slowly and ominously pulls its characters together - towards a seemingly inevitable and tragic conclusion. Filled with powerful performances from Geoffrey Rush, Paul Schneider, Ewen Leslie and Odessa Young, The Daughter’s stand out performance comes from Sam Neill. He is superb as Walter - effortlessly portraying a man who, after a series of brutal setbacks, understands the true value of life. Stone adapted The Daughter from Henrik Ibsen’s play, The Wild Duck. Having adapted the play for a successful stage production, he was already an expert on the text. Stone was also more than aware of the unique demands of the film medium. While its stage roots remain evident, The Daughter is undeniably cinematic. Cinematographer, Andrew Commis, makes the most of his stunning locations to create the film’s brooding atmosphere. Meanwhile, Stone’s effective use of dialogue (often running across several scenes) is reminiscent of the style of Terrence Malick. The end result is a gripping drama made all the more powerful thanks to the performances of its superb cast. The Daughter was filmed in the Tumut and Batlow region in Southern New South Wales. Ewen Leslie also starred in Stone's stage adaptation of Ibsen's play. Have you seen The Daughter? If you have, what did you think of this film? Let me know by leaving me a comment in the space below!